I think I was eight the first time I read the Narnia books. The Christian allegory went right over my head. I did wonder why Aslan was a lamb at the end of The Voyage of the Dawn Threader (it seemed rather silly), but other than that, I was a happy reader. Quite a few things went over my head at the time, but I was used to that; in fact, I still am. I don't expect it will change. 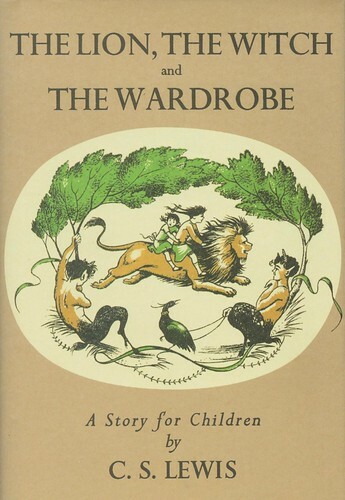 The Lion, the Witch and the Wardrobe is not the first book in the internal chronology of the Narnia series (and I must admit that when I found The Magician's Nephew, I felt a little like I imagine archaeologists do when they find a text only hinted at in later ones), but it was in fact the first one published (and, as far as I know, the first one filmed -- has anyone actually tried to film The Magician's Nephew -- or The Horse and his Boy for that matter?). It is probably also the one with the clearest Christian allusions (with the possible exception of The Last Battle, where Lewis pretty much gives up on allusions and goes straight for explicit declarations). He had a strange, but pleasant little face, with a short pointed beard and curly hair, and out of the hair there stuck two horns, one on each side of his forehead. One of his hands, as I have said, held the umbrella: in the other arm he carried several brown-paper parcels. What with the parcels and the snow it looked just as if he had been doing his Christmas shopping. He as a Faun. And when he saw Lucy he gave such a start of surprise that he dropped all his parcels. "Goodness gracious me!" exclaimed the Faun. I will confess I do still vaguely hope for Fauns with umbrellas and scarves and parcels to pop up when there is snow out and street lamps are lit. I know it is not very likely, but when things are ingrained at an early age.... At any rate, Mr Tumnus, as is his name, is not likely to have been shopping Christmas presents, as the following excerpt makes clear. "My old father, now," said Mr Tumnus; "that's his picture over he mantlepiece. He could never have done a thing like this." "A thing like what?" said Lucy. "Like what I've done," said the Faun. "Taken service under the White Witch." "The White Witch? Who is she?" "Why, it is she that has got all Narnia under her thumb. It's she that makes it always winter. Always winter and never Christmas; think of that!" Lucy is spot on. I keep returning to how the point of Christmas is to remind us that the dark period is not going to last forever. Lewis quite cleverly makes use of that as a way of showing the wrongness of the White Witch. She halts the progress of the seasons, freezes Narnia; and the sign of the horror of this dreadful power (which turns snow from something idyllic and sweet into something troubling) is of course that there can be no Christmas. In part because Christmas is a promise that the sun and spring (and thereby life) will return; in part because in Christian tradition (and Lewis was very much a part of that), Christmas brings the baby Jesus and therefore breaks the hold of evil powers on mankind. "She is a perfectly terrible person," said Lucy. "She calls herself the Queen of Narnia though she has no right to be queen at all, and all the Fauns and Dryads and Naiads and Dwarfs and Animals -- at least all the good ones -- simply hate her. And she can turn people into stone and do all kinds of horrible things. And she has made a magic so that it is always winter in Narnia -- always winter, but it never gets to Christmas. And she drives about on a sledge, drawn by reindeer, with her wand in her hand and a crown on her head." You are, I hope beginning to see a pattern. The greatest crime of the White Witch is that she has made eternal winter without Christmas. "It's all right," he was shouting. "Come out, Mrs Beaver. Come out, Sons and Daughters of Adam. It's all right! It isn't Her!" This was bad grammar of course, but that is how beavers talk when they are excited; I mean, in Narnia -- in our world they usually don't talk at all. So Mrs Beaver and the children came bundling out of the cave, all blinking in the daylight, and with the earth all over them, and looking very frowsty and unbrushed and uncombed and with sleep in their eyes. "Come on!" cried Mr Beaver, who was almost dancing with delight. "Come and see! This is a nasty knock for the Witch! It looks as if her power is already crumbling." "What do you mean Mr Beaver?" panted Peter as they all scrambled up the steep bank of the valley together. "Didn't I tell you," answered Mr Beaver, "that she'd made it always winter and never Christmas? Didn't I tell you? Well, just come and see!" It is not just Lucy who is obsessed with Christmas. And they were all at the top and did see. It was a sledge, and it was reindeer with bells on their harness. But they were far bigger than the Witch's reindeer, and they were not white but brown. And on the sledge sat a person whom everyone knew the moment they set eyes on him. He was a huge man in a bright red robe (bright as holly berries) with a hood that had fur inside it and a great white beard that fell like a foamy waterfall over his chest. Everyone knew him because, though you see people of his sort only in Narnia, you see pictures of them and hear them talked about even in our world -- the world on this side of the wardrobe door. "I've come at last," said he. "She has kept me out for a long time, but I have got in at last. Aslan is on the move. The Witch's magic is weakening." Which makes all the more sense when Aslan is tied (quite literally) to Jesus later in the book. Before that can happen, however, Father Christmas drops off presents: A shield and a sword for Peter, bow and arrows (though only for great need "for I do not mean you to fight in the battle" because "battles are ugly when women fight") and a horn for Susan, and for Lucy a healing potion and a small dagger. Then he cried out "Merry Christmas! Long live the true King!" and cracked his whip. The true King being Aslan, of course. And they are not the only ones to receive gifts, as the Witch finds out when she rather rudely interrupts a party, the description of which is all about Christmas cheer. A little way off at the foot of a tree say a merry party, a squirrel and his wife with their children and two satyrs and a dwarf and an old dog-fox, all on stools round a table. Edmund couldn't quite see what they were eating, but it smelled lovely and there seemed to be decorations of holly and he wasn't at all sure that he didn't see something like plum pudding. At the moment when the sledge stopped, the Fox, who was obviously the oldest person present, had just risen to its feet, holding a glass in its right paw as if it was going to say something. But when the whole party saw the sledge stopping and who was in it, all the gaiety went out of their faces. The father squirrel stopped eating with his fork halfway to his mouth and one of the satyrs stopped with his fork actually in his mouth, and the baby squirrels squeaked in terror. She asks them what is going on, and when they tell her they got the food from Father Christmas, she is not amused. Edmund saw the Witch bite her lips so that a drop of blood appeared on her white cheek. Then she raised her wand. Oh, don't, don't, please don't," shouted Edmund, but even while he as shouting she had waved her wand and instantly where the merry party had been there were only statues of creatures (one with its stone fork fixed forever halfway to its stone mouth) seated round a stone table on which there were stone plates and stone plum pudding. Edmund for the first time in this story felt sorry for someone besides himself. It seemed so pitiful to think of those little stone figures sitting there all the silent days and all the dark nights, year after year, till the moss grew on them and at last even their faces crumbled away. Now they were steadily racing on again. And soon Edmund noticed that the snow which splashed against them as they rushed through it was much wetter than it had been all last night. ... And his heart gave a great leap (though he hardly knew why) when he realized that the frost was over. The snow is melting, things are getting greener, and sunlight appears. Every moment the patches of green grew bigger and the patches of snow grew smaller. Every moment more and more of the trees shook off their robes of snow. ... Shafts of delicious sunlight struck down onto the forest floor and overhead you could see a blue sky between the tree tops. The trees began to come fully alive. The larches and birches were covered with green, the laburnums with gold. Soon the beech trees had put forth their delicate transparent leaves. As the travelers walked under them the light also became green. A bee buzzed across their path. "This is no thaw," said the dwarf, suddenly stopping. "This is Spring. What are we to do? Your winter has been destroyed, I tell you! This is Aslan's doing." "If either of you mentions that name again," said the Witch, "he shall be instantly killed." "though the Witch knew the Deep Magic, there is a magic deeper still which she did not know. But if she could have looked a little further back, into the stillness and the darkness before Time dawned, she would have read there a different incantation. She would have known that when a willing victim who had committed no treachery was killed in a traitor's stead, the Table would crack and Death itself would start working backward." If anyone is hearing pre-echoes of Harry Potter, I think you are probably right; though Lewis is more focused on Biblical allusions of the stone breaking and life everlasting, not to mention Resurrection. Though we, between ourselves, can read it as a Nature myth, in which the resurrection of Aslan becomes like the resurrection of Adonis, or of Persephone, commenting on the rebirth of nature after the darkness and death of winter. Or we can try. Jeg husker fortsatt første gangen jeg leste The Lion, the Witch and the Wardrobe, som en liten gutt på 23. Ganske lettvint lesing, i grunn, men engasjerende likefullt. Jeg skulle egentlig ønske jeg leste bøkene da jeg var yngre. TV-serien som gikk på NRK fra tid til annen i gamle dager var jo sykt spennende. Når jeg tenker på det nå kan jeg faktisk vagt erindre å ha lånt en Narnia-bok på bibliteket en gang for lenge siden, men jeg er rimelig sikker på at jeg ikke leste dem før i 2005. Jeg ser forøvrig nå at The Magician's Nephew heter Drømmen om Narnia på norsk, så da spørs det om jeg har spurt etter den (siden det var navnet på TV-serien på NRK) og fått en bok jeg ikke kjente igjen historien i. Bittert i grunn, jeg tror jeg ville digget å få vite mer om Narnia etter å ha sett TV-serien som barn.